“Shan shui (Chinese: 山水 lit. "mountain-water") refers to a style of Chinese painting that involves or depicts scenery or natural landscapes, using a brush and ink rather than more conventional paints. Mountains, rivers and often waterfalls are prominent in this art form. Paths - Pathways should never be straight. They should meander like a stream. This helps deepen the landscape by adding layers. The path can be the river, or a path along it, or the tracing of the sun through the sky over the shoulder of the mountain.. The concept is to never create inorganic patterns, but instead to mimic the patterns that nature creates. The Threshold - The path should lead to a threshold. The threshold is there to embrace you and provide a special welcome. The threshold can be the mountain, or its shadow upon the ground, or its cut into the sky. The concept is always that a mountain or its boundary must be defined clearly. Ink wash painting, also known as literati painting is an East Asian type of brush painting that uses black ink – the same as used in East Asian calligraphy, in various concentrations. For centuries, this most prestigious form of Chinese art was practiced by highly educated scholar gentlemen or literati. Names used in the cultures concerned include: in Chinese shui-mo hua (水墨畫), in Japanese sumi-e (墨絵) or suibokuga (水墨画? ), in Korean sumukhwa (수묵화), and in Vietnamese tranh thuỷ mặc(幀水墨). 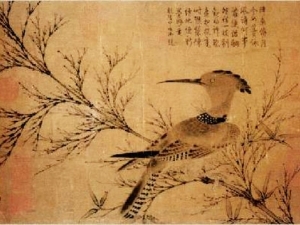 Ink wash painting developed in China during the Tang Dynasty (618–907). Wang Wei is generally credited as the painter who applied color to existing ink wash paintings. 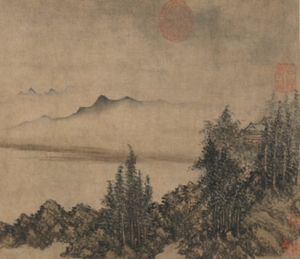 The art was further developed into a more polished style during the Song Dynasty (960–1279). It was introduced to Korea shortly after China's discovery of the ink. The art of ink painting has been brought from China to Japan during the 13th century where it developed itself as a Zen art, known as Sumi-e. The art of Sumi-e is not only to understand the unity of life, but to experience it. One has to be in the moment and capture the vital essence out of a deep connection with nature. Sumi-e is meditative, and unlike western art, the act of painting itself is valued as much as the product. In fact, preparing the ink “signals” the start of meditation. At the end of the painting, the master will add a red seal. "If we study Japanese art, we see a man who is undoubtedly wise, philosophic and intelligent, who spends his time doing what? In studying the distance between the earth and moon? No. In studying Bismark's policy? No. He studies a single blade of grass." – Vincent Van Gogh. Technique: Ink wash painting uses tonality and shading achieved by varying the ink density, both by differential grinding of the ink stick in water and by varying the ink load and pressure within a single brushstroke. Ink wash painting artists spend years practicing basic brush strokes to refine their brush movement and ink flow. In the hand of a master, a single stroke can produce astonishing variations in tonality, from deep black to silvery gray. Thus, in its original context, shading means more than just dark-light arrangement: It is the basis for the beautiful nuance in tonality found in East Asian ink wash painting and brush-and-ink calligraphy. 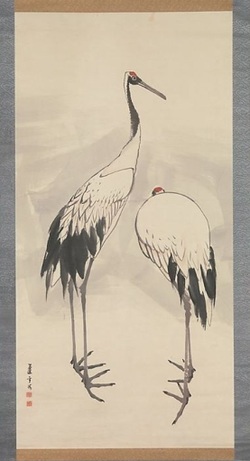 Rice paper: Ink wash painting is usually done on xuan paper (Chinese) or washi (Japanese paper) both of which are highly absorbent and unsized. Silk is also used in some forms of ink painting. Ink and inkstone: In ink wash paintings, as in calligraphy, artists usually grind inkstick over an inkstone to obtain black ink, but prepared liquid inks (墨汁 in Japanese, bokuju) are also available. Most inksticks are made of soot from pine or oil combined with animal glue. 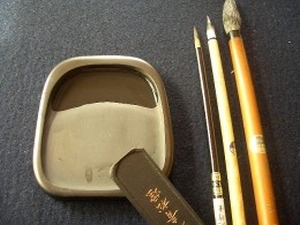 An artist puts a few drops of water on an inkstone and grinds the inkstick in a circular motion until a smooth, black ink of the desired concentration is made. Inksticks themselves are sometimes ornately decorated with landscapes or flowers in bas-relief and some are highlighted with gold. Brush: Ink wash painting brushes are similar to the brushes used for calligraphy and are traditionally made from bamboo with goat, cattle, horse, sheep, rabbit, marten, badger, deer, boar and wolf hair. The brush hairs are tapered to a fine point, a feature vital to the style of wash paintings. Traditionally calligraphy is closely bonded with painting. The Asian brush, not necessarily a tool to depict reality, it is more of an instrument through which the artist expresses his or her inner mood and emotions. 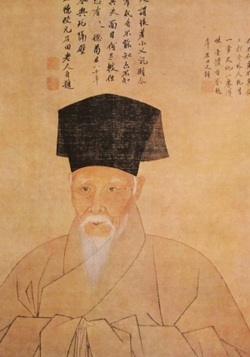 In painting, this led to the concept of "writing the idea" or meaning (Xie Yi, 写意) where the basic techniques of calligraphy became a major influence. This intimate relationship between calligraphy and painting is further intensified by the development of a tradition of incorporating calligraphy into painting. Here, again, calligraphy plays a unique role in the appreciation of art. The Asian artist can use calligraphy as an additional way to express and explain his or her feelings. This can be in the form of a poem, a description of the occasion and circumstances in which a particular piece of art was made, a dedication to the receiver of the work or just a seemingly random remark about life or a certain event. The common denominator being the fact that the artist can better clarify his/her intentions as well as use it as an additional element in the composition. The Chinese painter uses "art within art"